What every nail technician or hair stylist needs! Keep all your client's info at hand in this awesome binder! 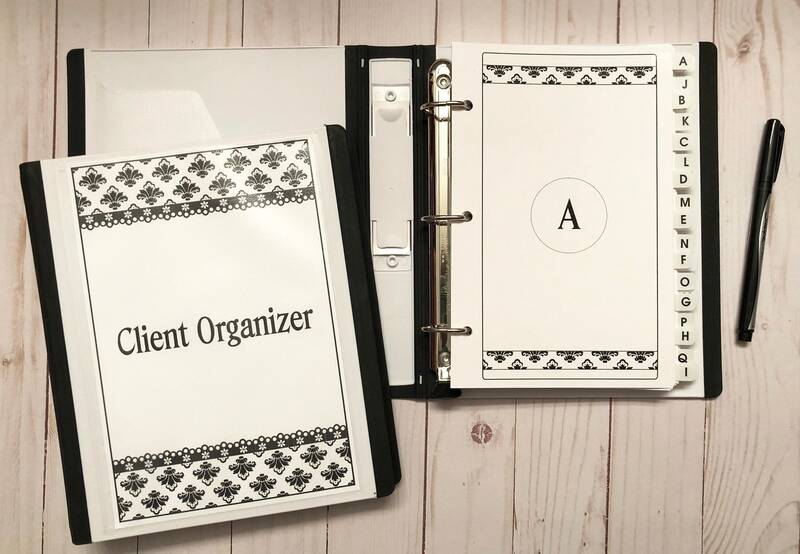 This binder comes complete with 100 client consultation pages (black and white) with service record pages on the back to keep track of their appointments. ARTWORK AT TOP OF THE PAGE MAY VARY SLIGHTLY FROM WHAT IS SHOWN BUT WILL STILL BE SAME STYLE. Also includes divider pages with alphabetical tabs A-Z (X, Y and Z are combined on one page). - Pages printed on high quality 28 lb. bright white paper. - Divider Pages printed on 110 lb. cardstock. Additional refill pages for this binder can be ordered. Contact me for pricing. If the format of this book doesn't work for you I can create a custom book with everything you need. An extra $15 custom order charge will apply. - Since all items are made to order I do not offer refunds. - This item is NOT available for download. - Ships via USPS Priority Mail.